Adjusting Counted Inventory – Pacific Amber Technologies Inc.
1. 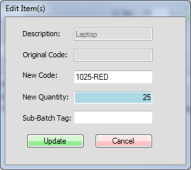 If you need to make any corrections within a counted batch simply double click the item, or select it and use the button. 2. This will display the Edit Item(s) window, which you can use to adjust the quantity. Once you have entered a new quantity and pressed , the newly updated item will temporarily be coloured blue in the inventory count window.